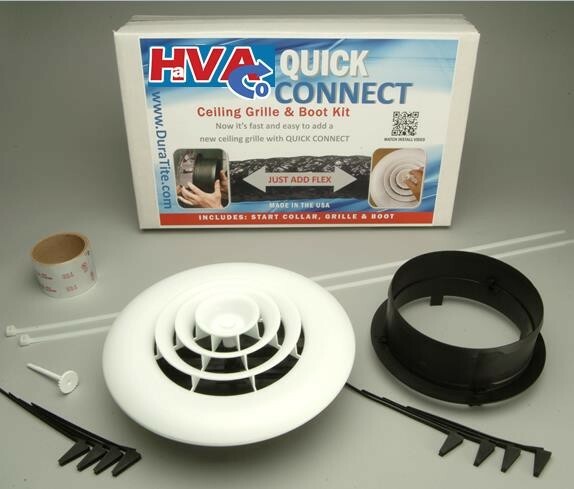 HaVACo's Start To Finish Ceiling Vent Kit features a 6" or 8" Start Collar, 6" or 8" Register Boot with and 12" Square or Round Ceiling Grille with or without a damper. No tools are needed to attach the grille to the register boot. 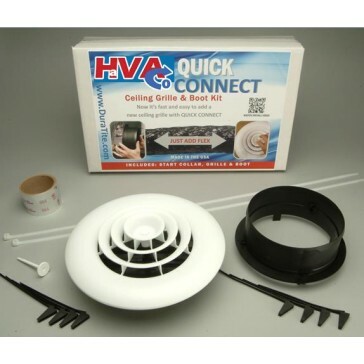 The patented easy attach knob allows just the grille to be removed for painting or cleaning. Now you can get your start collar, register boot and ceiling grille in one convenient, easy to install kit. The Kit includes Quick Zips for Start Collar and Boot install, a 36" cable tie and a 2" x 5yd UL approved foil tape roll to easily attach your flex duct. © 2013 HaVACo Online Store. All Rights Reserved.